Background: Between 2003 and 2010 digital mammography (DM) gradually replaced screen-film mammography (SFM) in the Dutch breast cancer screening programme (BCSP). Previous studies showed increases in detection rate (DR) after the transition to DM. However, national interval cancer rates (ICR) have not yet been reported. Methods: We assessed programme sensitivity and specificity during the transition period to DM, analysing nationwide data on screen-detected and interval cancers. 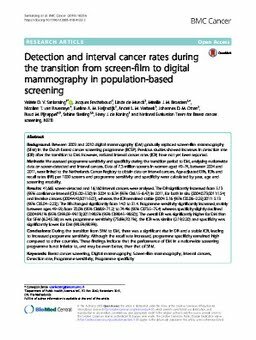 Data of 7.3 million screens in women aged 49-74, between 2004 and 2011, were linked to the Netherlands Cancer Registry to obtain data on interval cancers. Age-adjusted DRs, ICRs and recall rates (RR) per 1000 screens and programme sensitivity and specificity were calculated by year, age and screening modality. Results: 41,662 screen-detected and 16,160 interval cancers were analysed. The DR significantly increased from 5.13 (95% confidence interval (CI):5.00-5.30) in 2004 to 6.34 (95% CI:6.15-6.47) in 2011, for both in situ (2004:0.73;2011:1.24) and invasive cancers (2004:4.42;2011:5.07), whereas the ICR remained stable (2004: 2.16 (95% CI2.06-2.25);2011: 2.13 (95% CI:2.04-2.22)). The RR changed significantly from 14.0 to 21.4. Programme sensitivity significantly increased, mainly between ages 49-59, from 70.0% (95% CI:68.9-71.2) to 74.4% (95% CI:73.5-75.4) whereas specificity slightly declined (2004:99.1% (95% CI:99.09-99.13);2011:98.5% (95% CI:98.45-98.50)). The overall DR was significantly higher for DM than for SFM (6.24;5.36) as was programme sensitivity (73.6%;70.1%), the ICR was similar (2.19;2.20) and specificity was significantly lower for DM (98.5%;98.9%). Conclusions: During the transition from SFM to DM, there was a significant rise in DR and a stable ICR, leading to increased programme sensitivity. Although the recall rate increased, programme specificity remained high compared to other countries. These findings indicate that the performance of DM in a nationwide screening programme is not inferior to, and may be even better, than that of SFM.